Touting its ability to lay the groundwork for future human voyages, NASA officials announced Wednesday a robotic probe named OSIRIS-REx will launch to an asteroid in 2016 and return up to 4 pounds of rock and dust to Earth seven years later. Led by a research team at the University of Arizona in Tucson, OSIRIS-REx will approach a carbon-rich asteroid and collect samples with an air gun. Scientists expect the asteroid harbors organic molecules, the building blocks that may have kick-started life on Earth. "We are bringing back what we believe is the type of material that led to the building blocks of life, that led to us," said Michael Drake, principal investigator of the OSIRIS-REx mission from the University of Arizona. "Nothing like that exists right now. It will be a resource that I guarantee will be looked at by generation after generation." OSIRIS-REx stands for the Origins, Spectral Interpretation, Resource Identification, Security-Regolith Explorer. After blasting off from Florida in September 2016, the craft will reach an asteroid designated 1999 RQ36 in 2020. Once it maps the surface from a close-up orbit, the probe will descend and extend a robot arm to blow nitrogen gas on the surface, lifting particles into a capture mechanism. Drake said the device looks like a car's air filter, and it will corral at least 60 grams, or about one-eighth of a pound, of asteroid material. But testing shows the sampler could collect up to 2 kilograms, or 4.4 pounds, of rock fragments and dust in just a few seconds. The spacecraft will be manufactured by Lockheed Martin Corp. The scientific instruments will come from the University of Arizona, NASA's Goddard Space Flight Center, Arizona State University and the Canadian Space Agency. It will weigh about 3,370 pounds at launch, according to Jeff Grossman, NASA's OSIRIS-REx program scientist. 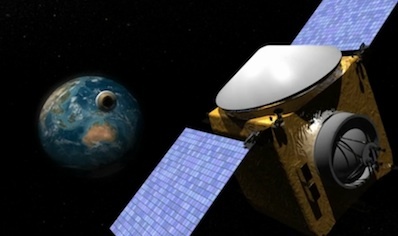 The total cost of OSIRIS-REx is expected to be around $1 billion, including a launch vehicle to send it away from Earth, according to Jim Green, director of NASA's planetary science division. The target asteroid is rich in carbon and spans approximately 1,900 feet in diameter. Its orbit crosses the path of Earth every September. "This asteroid is a time capsule from the birth of our solar system and ushers in a new era of planetary exploration," Green said. "The knowledge from the mission also will help us to develop methods to better track the orbits of asteroids." Asteroid RQ36 has garnered attention due to the low risk it could strike Earth. A research team from Spain concluded the asteroid has a 1-in-1,800 chance of hitting Earth in 2182, and although the threat if an impact is slim, the consequences would be catastrophic. OSIRIS-REx will measure the Yarkovsky effect, a phenomenon in which the absorption and emission of heat from the sun exerts a tiny push on the asteroid. Over time, the effect accumulates enough energy to alter an object's orbit, making threats to Earth more difficult to predict. Data from OSIRIS-REx will refine the asteroid's orbit and help officials plan strategies to respond to potential impacts. NASA Administrator Charles Bolden said OSIRIS-REx is a crucial mission to help the agency develop a human exploration program to send astronauts to destinations like asteroids. "This is a critical step in meeting the objectives outlined by President Obama to extend our reach beyond low Earth orbit and explore into deep space," Bolden said in a statement. "It's robotic missions like these that will pave the way for future human space missions to an asteroid and other deep space destinations." Green said scientific data from OSIRIS-REx will be shared with NASA's human space program, but the mission's selection was based purely on technical feasibility and scientific return. The mission's payload includes three cameras, near-infrared and thermal emission spectrometers, and a scanning laser to create a terrain map of the asteroid's irregular surface. 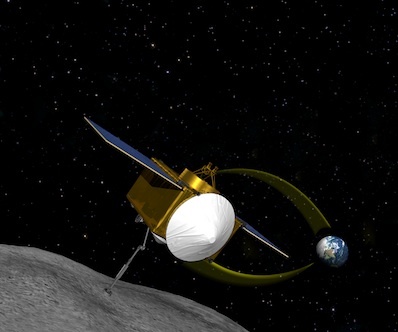 If successful, OSIRIS-REx will be the first U.S. mission to return samples from the surface of an asteroid. Japan's Hayabusa mission gathered microscopic dust grains from asteroid Itokawa and landed on Earth last year, successfully ending a star-crossed mission that overcame scores of technical snafus. "Nobody's really done this before in a way where they didn't have trouble," Drake said. Hayabusa's sampling device failed at Itokawa in 2005, and what little dust was collected was scraped up when the spacecraft inadvertently hit the surface. "The beauty of a sample return mission is it's the gift that keeps on giving," Drake said. Scientists believe primitive asteroids like RQ36 haven't changed much since the dawn of the solar system 4.5 billion years ago. Telescopic observations show RQ36 is abundant in carbon, the basic element for organic molecules. "We believe it's the sort of stuff that came in through the Earth's atmosphere when the liquid oceans first formed and provided those building blocks (for life)," Drake said. "What are they likely to be? Certainly, things like amino acids we know exist in space, and we expect to find those." 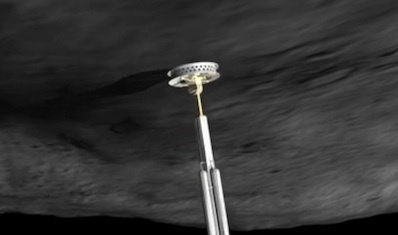 The mission's actual findings will have to wait until the craft reaches the asteroid in 2020. "We're bringing back something that is essentially untouched by human hands," Drake said. OSIRIS-REx, the third mission in NASA's New Frontiers program, beat out competing proposals to return samples from the moon's south pole region and a probe to land on Venus. Those scientific targets will go back into the pool for consideration in the next New Frontiers solicitation, which should begin in about five years, Green said. Other missions to be considered then include a comet surface sample return, a Saturn probe and a spacecraft to visit multiple Trojan asteroids sharing the orbit of Jupiter.